Jonathan designed and built our website 4 years ago, updating and modernising it also during that period.. Please find examples of our work including Website Design, Business Presentations, Online Shops, Online Marketing and Branding Design. The Content Management System for Clywedog Riverside Holiday Home Park allows the caravan park owners to manage the content as easily as editing a word document, just log-in and click edit next to the item you want to change. 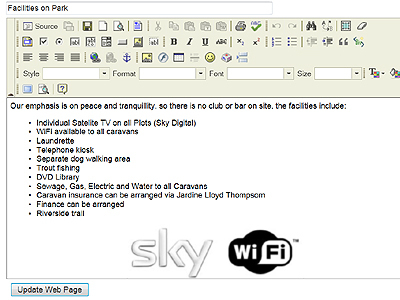 The caravan park can edit the page contents, add and edit new caravans, update the images in the main gallery, and the individual caravan gallery as well as adding photos in other sections of the text, add and edit Customer Views, Local Attractions and Web Links.